Michael is one of our Senior Archaeologists and has worked for Far Western since 1994. He was raised in Shasta County and received his B.A. in Anthropology from California State University, Chico. Michael has worked on numerous pipeline projects throughout northern California and Nevada and enjoys the logistical challenges and remoteness which often accompanies extensive linear corridors. 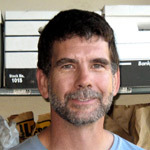 His research interests focus on the northern Sacramento Valley, with an emphasis on prehistoric lifeways in Shasta County. Life on the River: The Archaeology of an Ancient Native American Culture. Heyday Books, Berkeley, California.